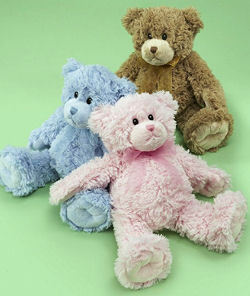 I’m looking for a First Impression Teddy Bear in Blue color. They sell them in Macy’s, and I also found it on Macy’s web site. I can’t buy it from Macy’s web, because my credit card does not have a US billing address, and they do not do transactions through PayPal. I’m looking for this bear, because my 18 months old son can’t live without it. We went on a trip to San Diego when he was 10 months old, and we happened to pass by Macy’s store. The second my son saw this bear he fell in love with it. He grabbed Blue from the shelf, and he never let it go. Now the bear goes everywhere my son goes. I can’t wash it, because he goes crazy when the bear is gone. He sleeps, eats, plays and does EVERYTHING with the bear. But, as you might understand, the bear is dirty, and I need to wash it. So I figured that I should buy TWIN bear, and it has to be the same, because I tried MANY, MANY bears, and it didn’t work. Nicolas wants his “YOYO” – that’s what he calls it. So I was wondering if somebody sells the bear, or maybe can do me a FAVOR and buy it from Macy’s web, and then I’ll rebuy it from them. I could buy it from Macys from you. Rosemary has my email address. You send me $20 via your paypal. Then let me know your address. I will let you know what shipping cost is to your address. I hope these help…I came across this web site while searching for an extra bunny that my son has had for two years but just recently became super attached to. I hope these are the right bear and please wish me luck on my search! Did you ever find the bear? My 3 year old loves his and has it with him constantly. Just found a new one on eBay and there are a few more if you still need it.